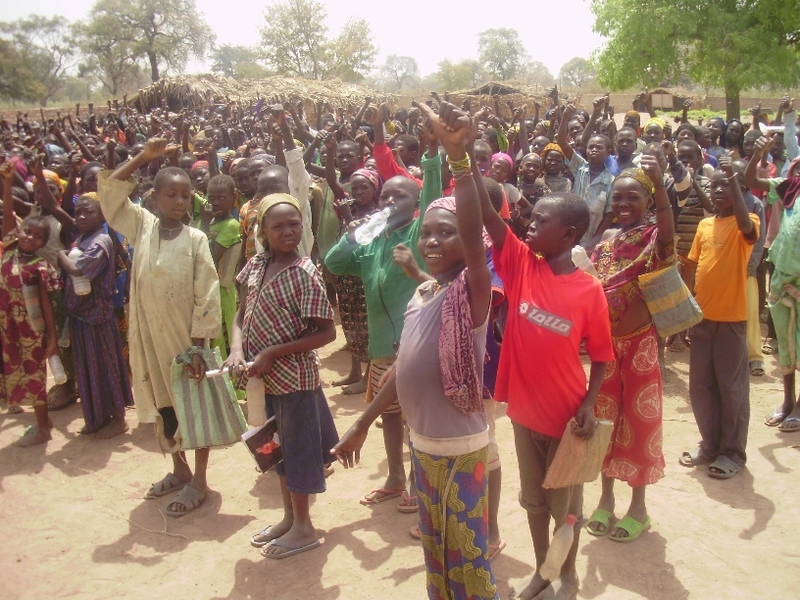 Our most recent well was drilled in the village of Jauro-Malam in Gombe State, Nigeria. Jaura-Malam is a Muslim village. It was our intention from the beginning of this program to reach out to the people who had the greatest need regardless of their religious or political background. 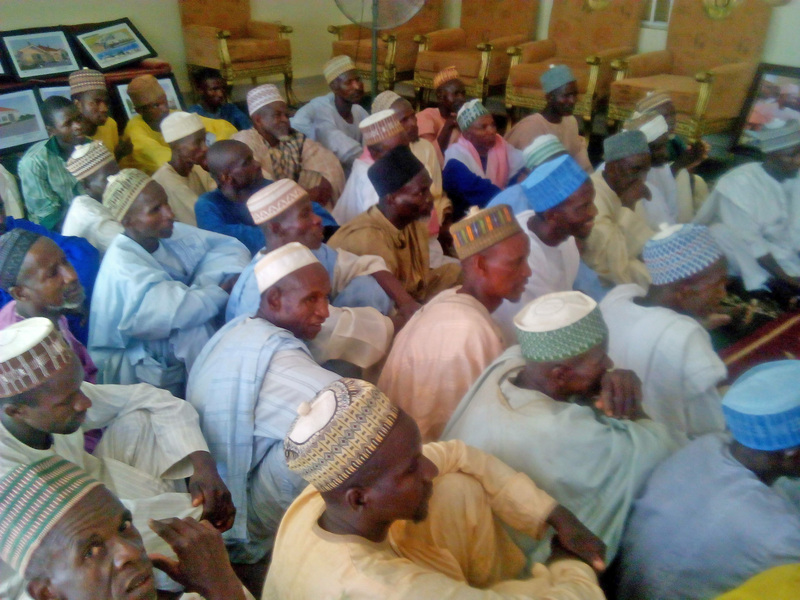 Gombe State has had a reputation for many years of being a state where all people could live in peace and harmony regardless of their religious or political heritage. This was a major factor in our choosing this area as a base for our operations. The expressions of thanksgiving and appreciation for this well have been so very heart warming. Rambi, our Director of Operations, sent me the follow note this week. 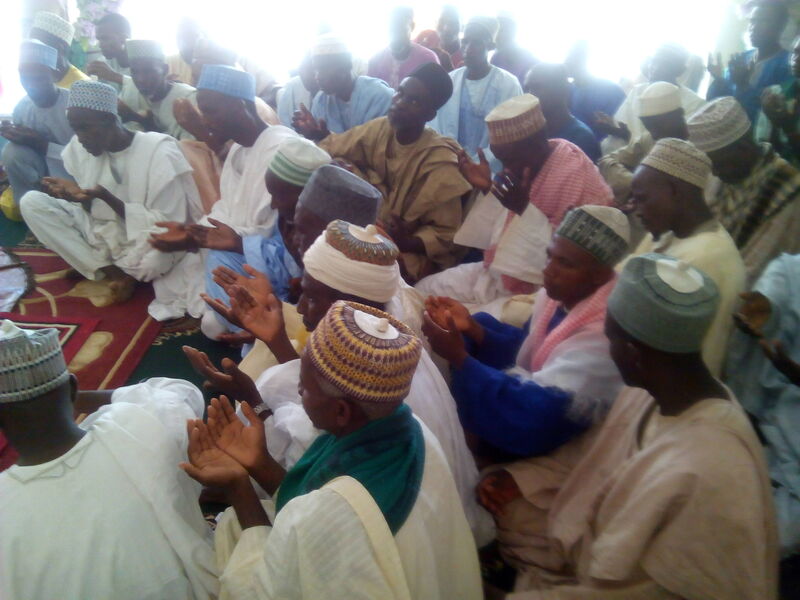 Prayers of thanksgiving are offered for their new well. There will be a special dedication service for this well in the next few days. I wish it were possible for you to see and hear these expressions of appreciation in the flesh. These are people who live with virtually nothing and have nothing to give in exchange for such a blessing. You or I could have been born there instead of here, and their circumstances could have been our own. Please continue to pray that the Lord of harvest will use these expressions of love to open hearts to hear and learn of HIM. Categories: New Wells, Well Drilling | Tags: New Wells, Nigeria, Wells | Permalink. “More grease to your elbow”, is a Nigerian expression of encouragement for someone to continue the good work that they are doing. They tell me that if you are British you will better understand this expression. Well we want to wish Eloi Madjiadouim, more grease to your elbow. Chad. His medical training would make him a close equivalent to a Nurse Practitioner here in the US. Since he joined our work over two years ago he has treated thousands of patients of all ages, the vast majority have been children. Only God knows how many lives have been saved because they received care from Eloi. Eloi lives a number of miles from the Health Center and makes this journey back and forth by bicycle every day. On occasions he will make an emergency visit to someone in distress in a village some distance from the Center. There are no paved roads, just paths through the marsh grass. Eloi is not as young as he used to be and working very long days, sometimes seeing hundreds of patients in a day’s time is very exhausting in and of itself. A couple months ago Eloi made a request for a motor bike. We would like to honor his request. There are a couple ways we can do that. 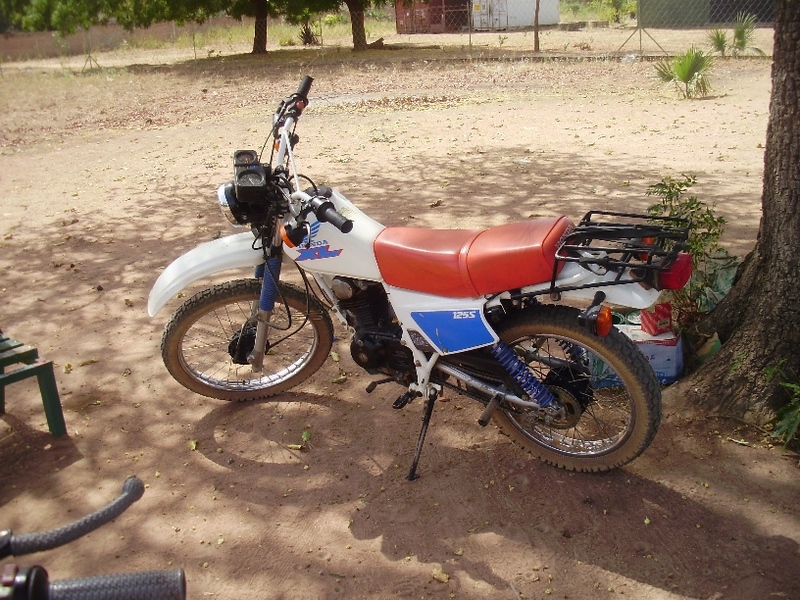 First, maybe someone has a small bike similar to the ones pictured in this article that is in good shape and running well they would like to donate. If we receive the bike before November 15th we will be able to include it in the crate containing our well drilling machine scheduled to leave for Chad shortly after the 15th. 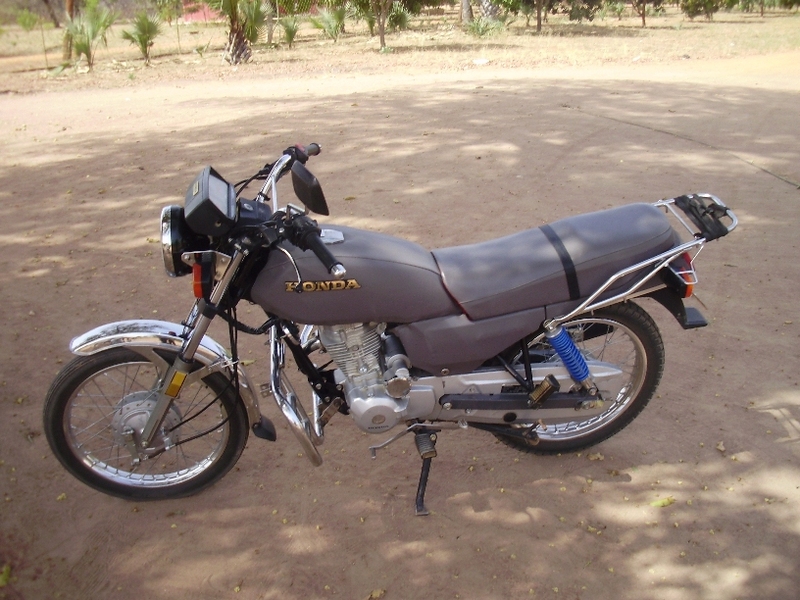 typical of new and used bikes that can be purchased in Chad. This will be such a special gift for a very special servant who shows the love of Christ to hurting people almost every day of his life. Thanks in advance for considering this need! If you have a bike to donate contact me by email: leehodges45 @ gmail.com (no spaces), or you may donate funds to purchase a bike online at www.hopespringsint.com or by mail: Hope Springs International, 118 Wessington Place, Hendersonville, TN 37075. Let’s “give more grease” to Eloi’s elbow! Categories: Clinic, Jordan Health Center, Motor Bike | Tags: Clinic, Dispensary, Jordan Health Center, Motor Bike | Permalink. French class. English is taught as well. 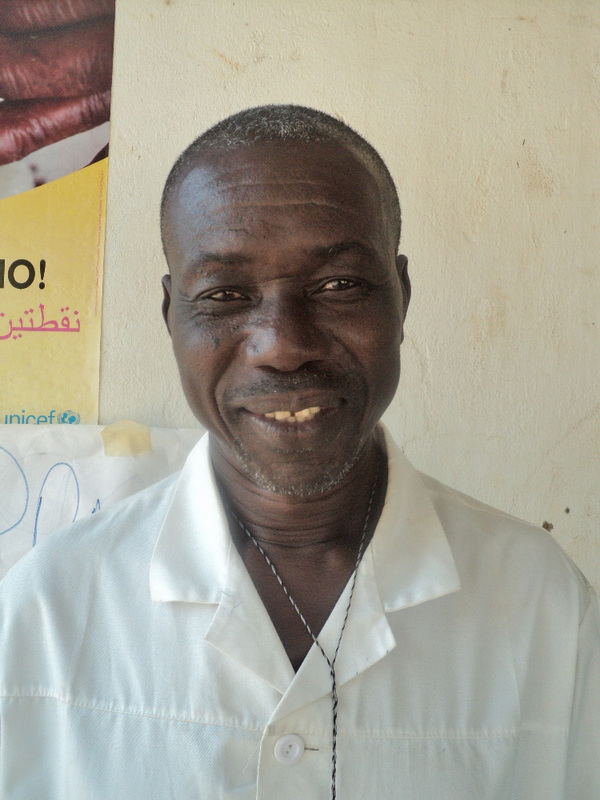 Exciting news just received from Pierre Rimorbi, project coordinator for Dono-Manga, Chad. young man from Dono-Manga named Sebastian, graduated from the Jos School of Biblical Studies and returned home a couple years ago and wanted to start a school. What began with a little over one hundred students has grown beyond our wildest dreams. 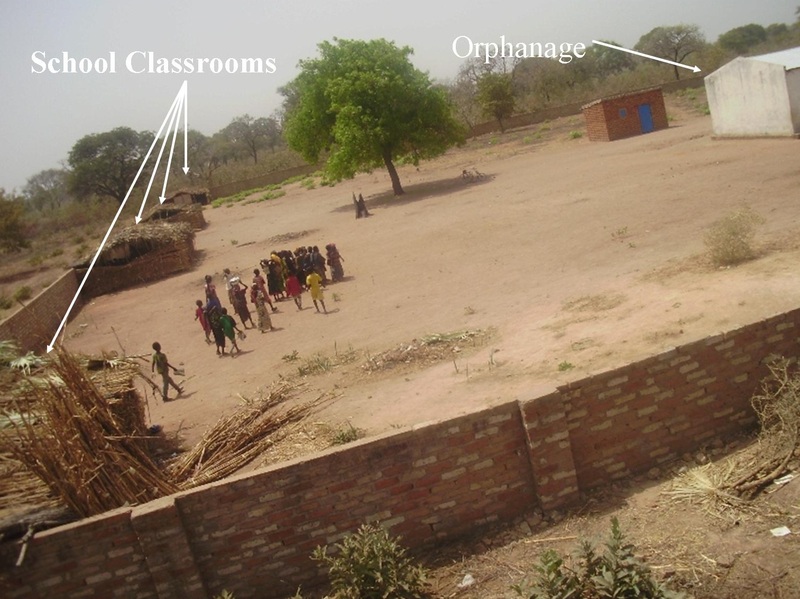 Children now come from miles around to attend school. Part of our teaching staff. Sebastian is second from left. One of the factors that has enabled such growth was our work to bring clean water to Dono-Manga. Many children were prevented from attending school because they spend their day searching for water. In 2009-2010 Hope Springs rehabilitated 26 out-of-service wells and drill 35 new wells providing clean accessible water to over 100,000 people. This has given many children the freedom to be able to attend school. Six more classroom have been added since this picture was taken. mostly volunteer staff of teachers whose classrooms are makeshift thatch huts along the compound wall where our orphanage is located. 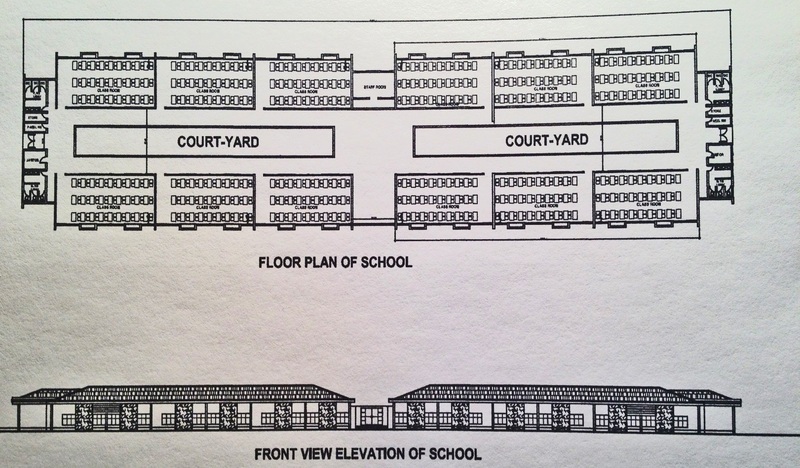 We will soon share plans for a permanent school building to house this growing school. 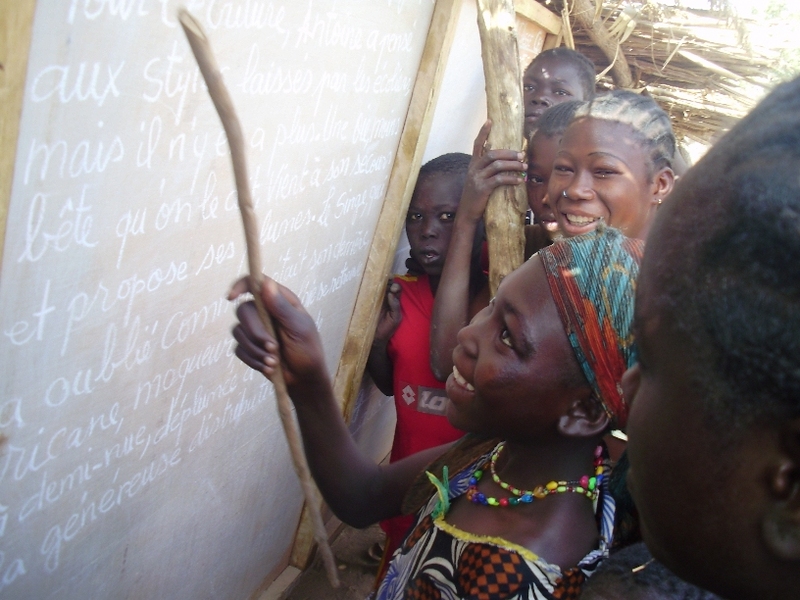 We believe that through this school we will be able to bring lasting change to much of southern Chad. If you would like to join us by supporting this journey you can go here to donate. CLICK ON PICTURE BELOW TO ENLARGE. Categories: School, School Building, Well Drilling | Tags: Children, School | Permalink. Dedication ceremonies for new boreholes in the villages of Sansani and Powishi Mongoro were held on September the 15th. This week we received a letter of appreciation for our work in these villages which are apart of the greater district of Kalmai. 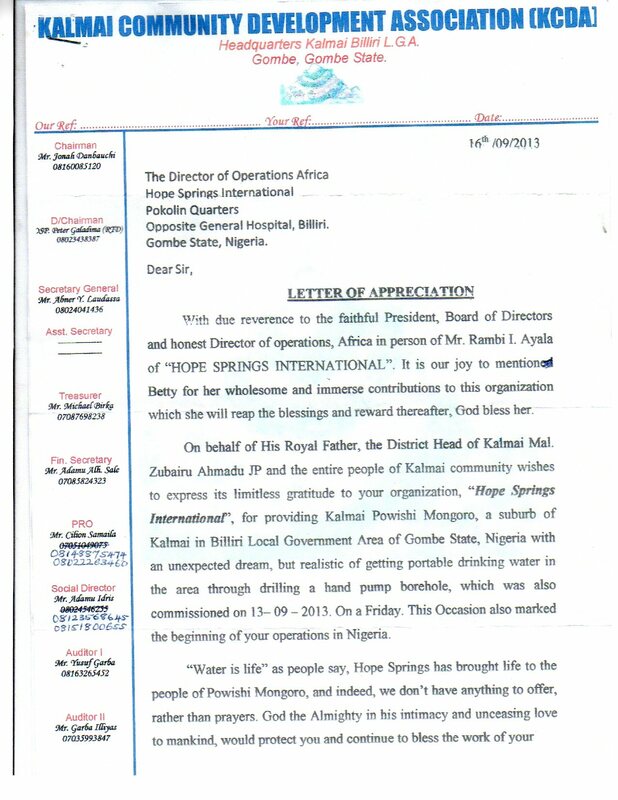 Categories: Letter of Appreciation | Tags: Letter of Appreciation | Permalink. I vividly remember the phone call that Sunday morning one year ago today. “Dad had a heart attack and is on his way to the Hospital”. 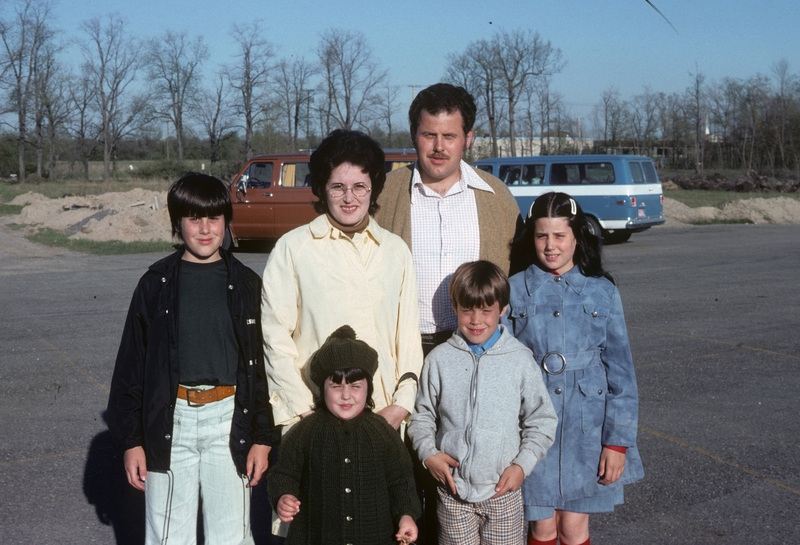 Then moments later the second call…“ Lee, dad didn’t make it, he died”. We are never prepared for “that” call. 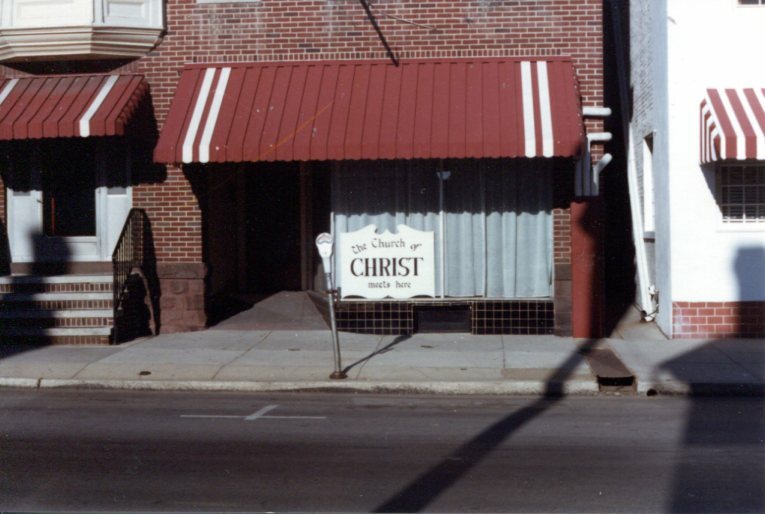 August of 1980 and work with the new Hanover Church of Christ. After our family left some 12 years later, Barry would preach for the Hanover church until his sudden death one year ago today. 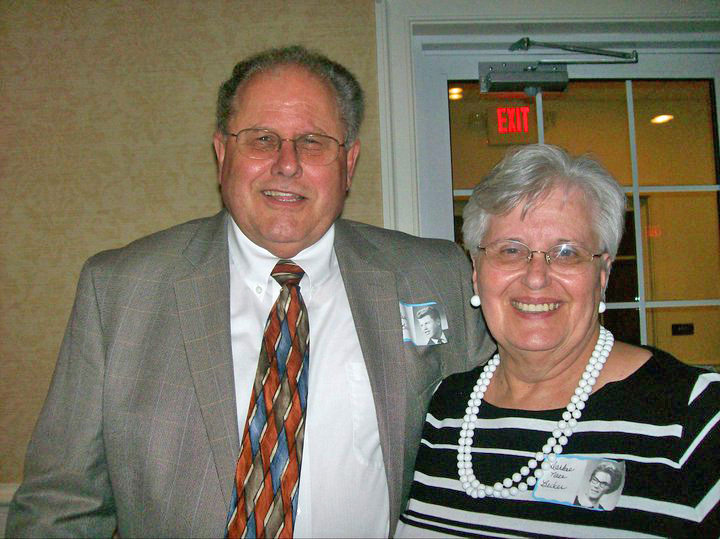 Barry was a great supporter of Hope Springs International (then Arewa Aid Inc.), and was one of our Board Members. He and Darlene visited our work in Nigeria in its infancy. 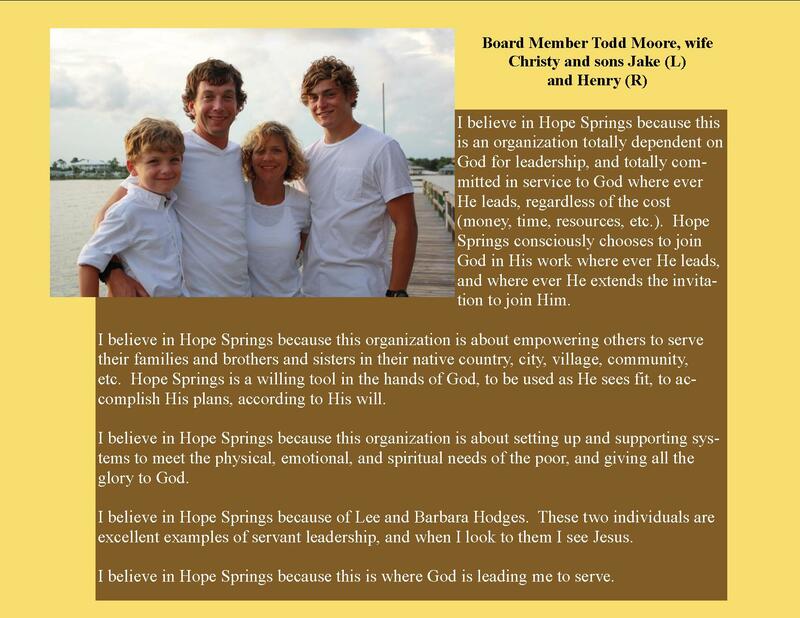 What is know as Hope Springs International today was actually founded by his youngest daughter and son in law Jennifer and Brad Blake. 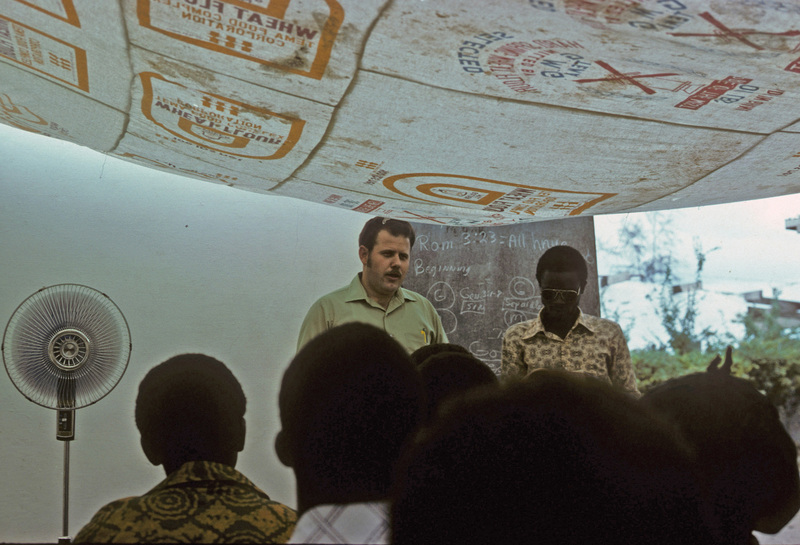 Barry preaching in Tema, Ghana West Africa. as I had done in the past, and share a personal struggle or joy. We both had done that for so many years. I miss those conversations so much. This will be a tough day for Barry’s children. Barry’s wife and their mother Darlene is being cared for in an Alzheimer care facility as they experience the hardest of all anniversaries. Join me in prayer for Chris Becker, Becky (Shawn) Fleming, Mark (Deena) Becker and Jennifer (Brad) Blake and all the Grand Children as they remember. One year ago today Barry went to be with Jesus. I would not bring him back for all the money in the world. He has received the promised reward that he lived for all those years I knew him. He was a faithful child of God who led many to Christ until Father called him home. I am so blessed to have known him. Miss you brother. See you soon! Categories: Board Members, Death | Tags: Board Members, Death | Permalink. 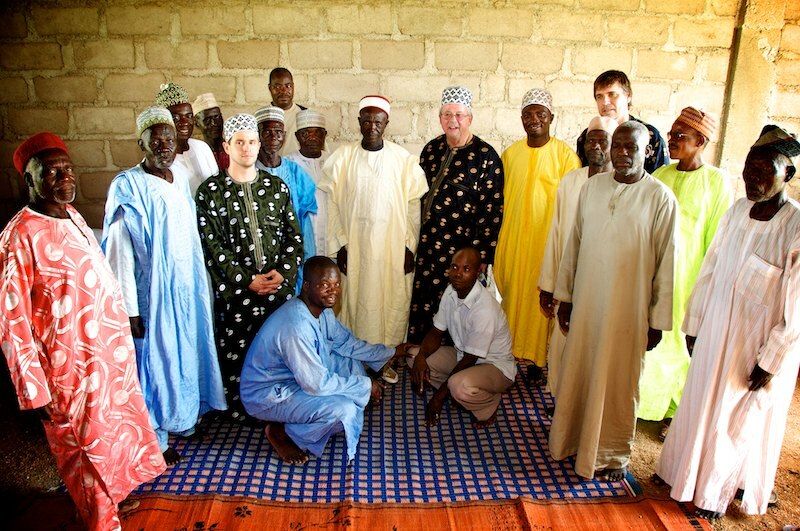 2010 meeting with Komta Village leaders. 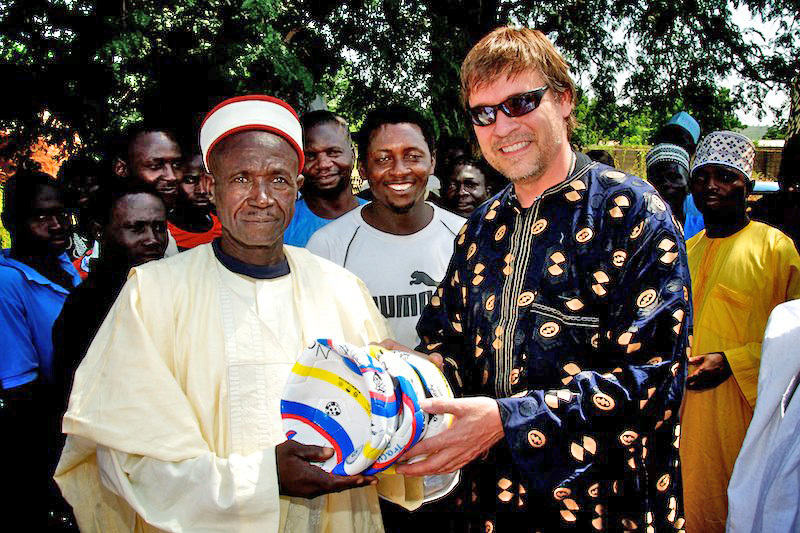 Board Member Phil Barnes presents Soccer Balls to Mr. Ajoji for the village youth. couple of the soccer balls that had been donated and signed by Bible classes at the Madison Church of Christ. 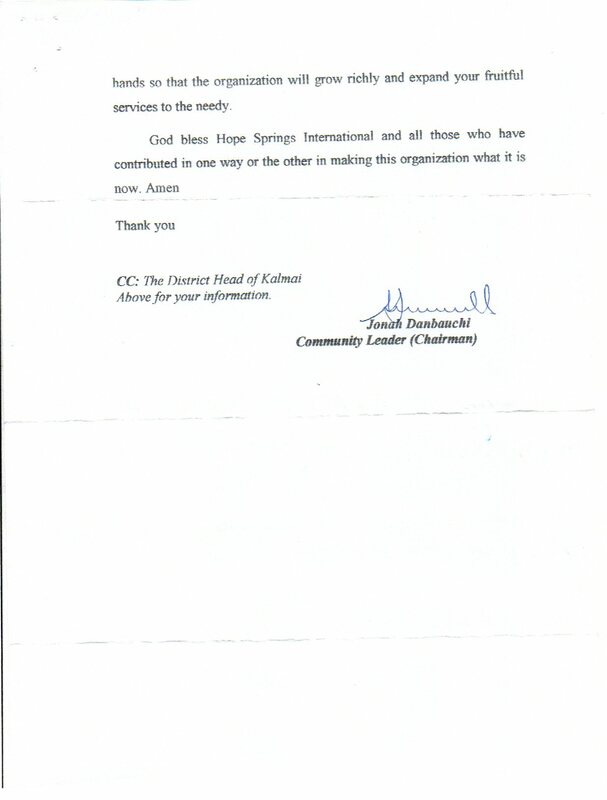 Phil gave these to Mr. Ajoji to be given to the young people present. 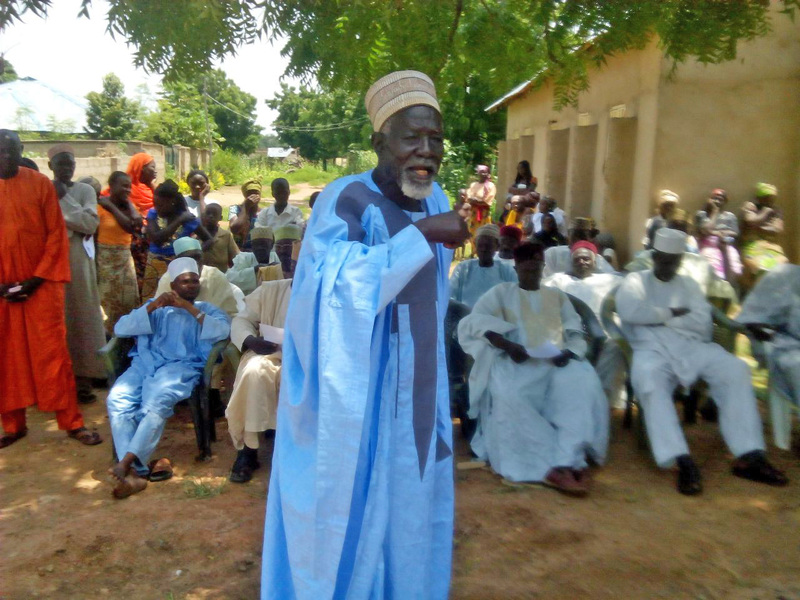 Mr. Dauda Ajoji tells the story of their struggle for clean water. 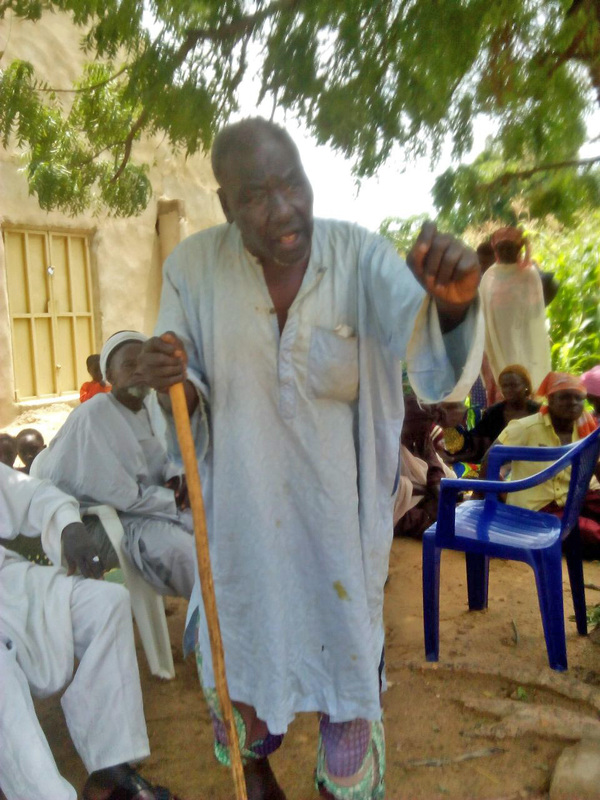 Director of Operations reported, “In his message Mr. Ajoji recalled the struggles of his people to get a well for his village, but without success until Hope Springs made it possible. He prayed for God to richly bless the donors and the work of Hope Springs for making this well possible. 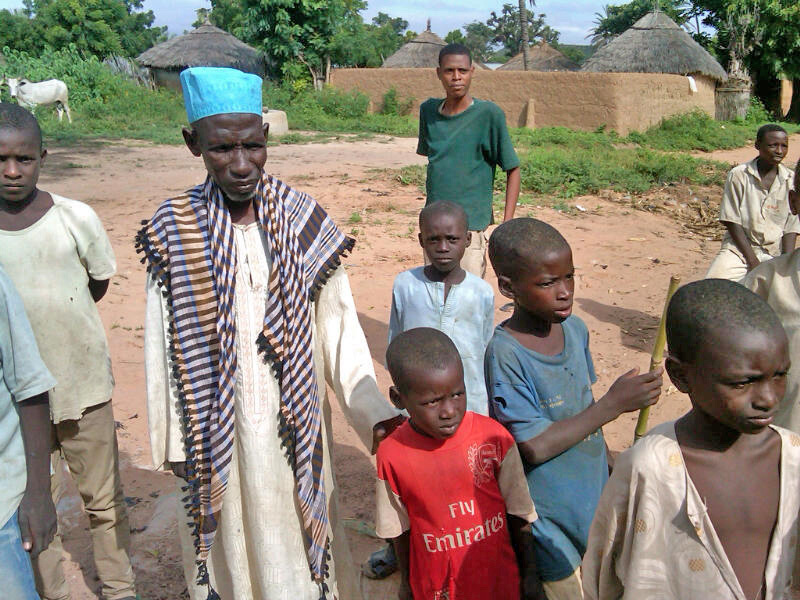 Baba Dale one of the oldest members of Komta tells of spending his life without a well. but leap for joy and danced in spite of his 80+ years. He thrilled those gathered with his dance and his joy because of what has happened to the community which he found unbelievable. He has lived his life without ever having a well from which to draw clean water. Baba and his wife are now worshiping with the Biliri Church where I minister. Mr Peter Kara, head of the village, also expressed his gratitude to Hope Springs for providing his community with a source of clean water that they have longed for, for years. Rambi’s report is a testimony to how one person or a group of people can bring lasting change to thousands of lives. Question? What if you accepted the challenge to raise $3,000 dollars for a well? What if you talked to other members of your Bible Class, Life Group, Church or co-workers? It is as simple as finding 30 people who would give $100. 15 to give $200.00. If you will accept the challenge we will provide you with pictures and information about the people in the village where the well is drilled that you can share with those who made it possible. 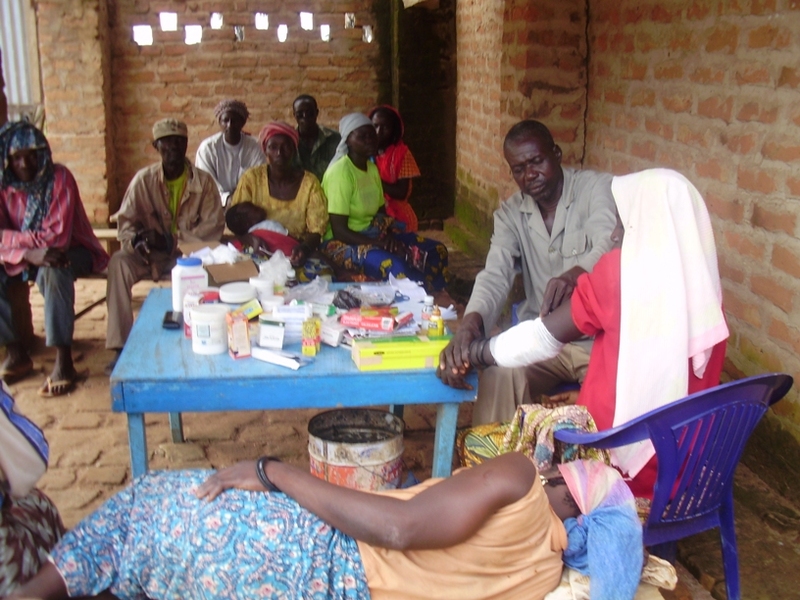 I pray that you will consider helping us bring lasting change to one village at a time! Categories: New Wells, Water, Well Drilling | Tags: New Wells, Water, Wells | Permalink.